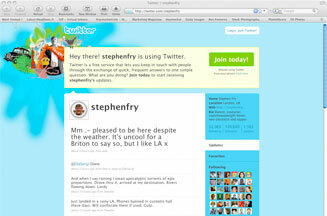 LONDON - Twitter has begun trialing text ad formats as it searches for ways to generate its first commercial revenues. The micro-blogging service has launched a series of ads promoting its widgets and search functionality. Currently ads promote Twitter Search, a real-time search listing of what people are Tweeting about, and Twitter Widgets as ‘an easy way to show your tweets on another website'. Currently in-house ads appear as a text box in the top right hand corner of on a user's profile page. Twitter is expected to roll out the ad format to third-party advertisers. But tweets on Marketing magazine's Twitter feed suggest that brands launching advertising on Twitter would not be well received by everyone. The Brand Counsel's Jeremy Kent suggested brand ads on Twitter feeds could be a ‘double-edged sword that would need to be carefully managed'. Will brands be willing to pay to be on Twitter?